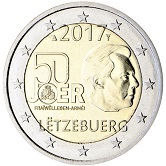 The coin commemorates the 50th anniversary of the establishment of the volunteer army of Luxembourg. Motif – on the right-hand side of the inner circle is an effigy of the reigning Grand Duke Henri, looking to the right. To the left of the effigy is a large stylised 50 and thereunder the word “JOER”. ( This means year in the local language). Within the O is the logo of the volunteer army. Under JOER is the inscription “Fräiwëllegen-Arméi” (Volunteer army in the local language). At the top of the inner circle is the year of issue preceded and followed by the mint mark and the mark of the mint master. At the bottom of the inner circle is the name of the issuing country in the local language “LËTZEBUERG”.